Veeam Backup for Microsoft Office 365 1.5 is available today! Veeam introduced Veeam Backup for Microsoft Office 365 in November 2016. This solution has quickly become very popular with many existing as well as new Veeam customers. With version 1.5, we are introducing new functionality to address many business needs. Scalability was a major focus during the development of this new version because it could solve many large Office 365 deployment challenges. Some companies that have moved entirely to Microsoft Office 365 want the backup of their crucial data also “as a Service.” To be able to support these requirements, development made sure that a single installation could scale out using proxy components (just like Veeam Backup & Replication scales out) with the use of multiple repositories to allow for segregation of data between customers. This segregation also solves business challenges for companies that need to make a distinction in retention time within the company. For instance, VIP-users’ email might need to be kept for a longer period compared to contractors. Another challenge that businesses need to overcome is the interaction with the Exchange Online servers. Due to the throttling mechanisms, it is not always easy to back up your valuable information within an ideal time frame. By adding the possibility to have more backup threads and the capability to limit bandwidth, those challenges can be overcome more easily. Creating new users, removing or disabling users – these are obviously common tasks that occur in many organizations daily. These daily tasks are most likely a small piece of other larger functions, like the onboarding or offboarding of users across all of your various systems. Think about creating the user in a directory service, creating and enabling the mailbox, connecting that user to an ERP system and, in our case, enabling the backup of that mail user. 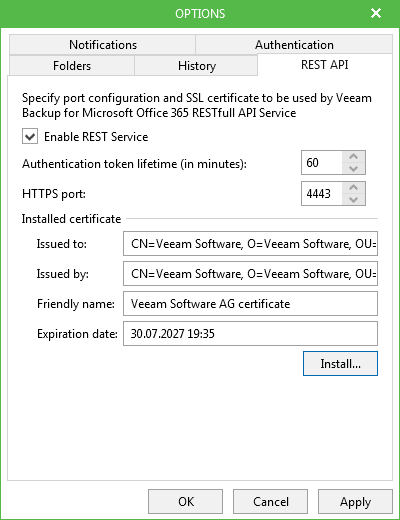 Veeam Backup for Microsoft Office 365 comes with full PowerShell and RESTful API support, allowing you to automate the backup, gaining back valuable time and making sure that all data is protected. There are MANY more scenarios that can be achieved with automation. Deploying new infrastructure components on premises, altering infrastructure configurations (adding proxies and repositories) and even automating the restore of Exchange Online items. The addition of a RESTful API allows service providers to integrate this service into their existing portal workflows, allowing them to automate tenant creation and deployment of segregated repositories, deploying more infrastructure components and much more. Some organizations are already all-in on Veeam Backup for Microsoft Office 365, while others might be in a migration phase, supporting a hybrid environment of Exchange Online and Exchange on premises. Other organizations prefer to keep their production data on premises but their archives in the cloud, or even the other way around depending on security requirements, legislation or other reasons. 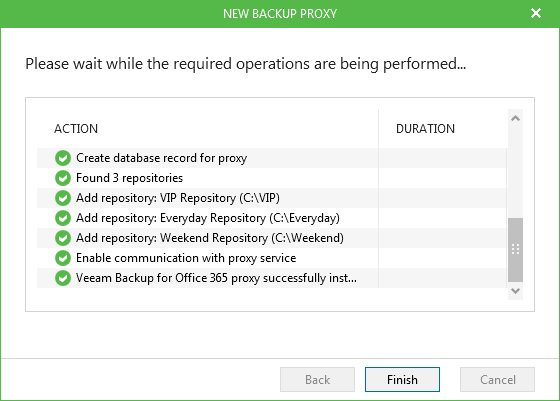 Veeam Backup for Microsoft Office 365 1.5 is able to cover all of these scenarios. 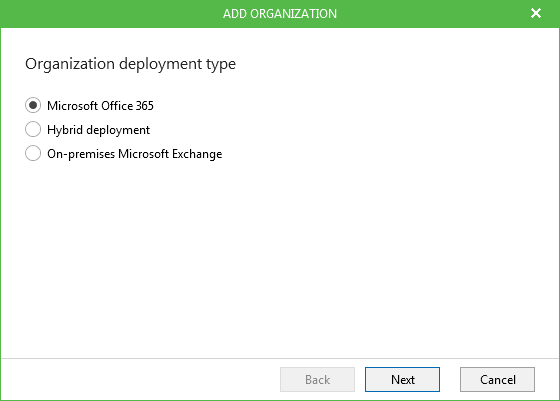 Finally, for service providers, Veeam Backup for Microsoft Office 365 allows tenants to use our very known and loved Veeam Explorer for Microsoft Exchange technology to connect remotely to their data and perform restores as they wish. 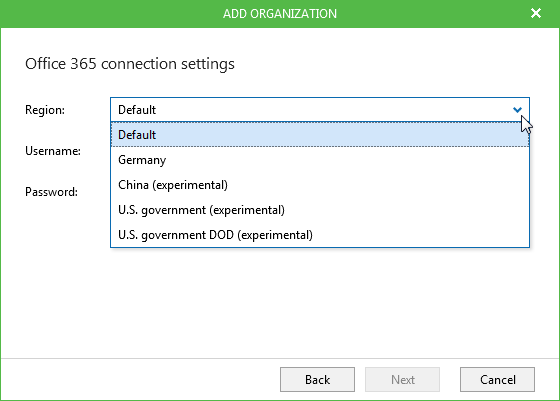 Our R&D team has listened to your feedback and has also expanded the platform support to include different Office 365 regions, such as the U.S. Government (DoD and non-DoD), Office 365 Germany and Office 365 China. Lastly, we’ve added support for protecting your valuable data in public folders, whether they exist on premises or in the cloud. Veeam Backup for Microsoft Office 365 1.5 is now generally available. Organizations have a solution to many of their business requirements, challenges and requests. Service providers are now given the ability to build-out a new Backup as a Service solution for their customers’ Office 365 email data. Obviously, there’s more – many other enhancements are included in this release, based on your requirements and solution needs that we’ve received through the community forums, face-to-face conversations or any other way that you reached out to us. Like all things Veeam, we’re certainly not stopping! Join the conversation and let us know your comments.